The Florida Engineering Society recognizes the importance of investing in the education of our youth. They are the future of our industry and of our world. We believe in inspiring students by raising awareness of engineering principles and showing them the practical application of the skills they are learning in the classroom. We encourage each of our members to find time throughout the year to speak in classrooms, serve in mentorship programs, tutor students after school, judge science fair projects or host a field trip. please contact Guillermo SImon at gsimon@taylorengineering.com for more information. The Florida Engineering Leadership Institute (FELI) class of 2012 created this engineering video for our members to share with students on K-12 visits. We thank them for their contribution to this worthy endeavor. If you would like to share this video, it is available for download here or linked on YOUTUBE at http://www.youtube.com/watch?v=nMf4HTVf6Bc. How much water do you consume? How does that compare with the usage rate of a developing country? Local engineers gave the students at Annunciation Catholic School a presentation about the considerations that Jacksonville Engineers Without Borders volunteers are giving to their water supply project in Honduras. The students then put their new skills into practice and built filters to clean dirty water samples. 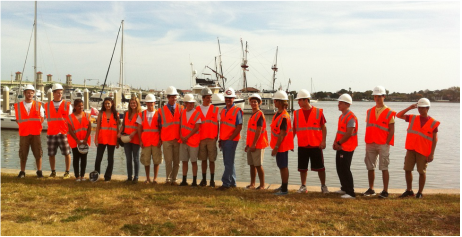 Local engineers visited Creekside High School to pose the project constraints of waterfront construction in the historic district of downtown St. Augustine. After discussing design options and material properties, the students were able visit the project and see the discussion come to life. TEACHERS: REQUEST A VOLUNTEER HERE! VOLUNTEERS: EAGER TO HELP? MAKE SURE WE CAN REACH YOU!